It seems appropriate that my day for posting on Kate’s 50th book blog party comes just after we’ve both got back from London where we were at the annual Association of Mills & Boon Authors’ lunch. That’s because it was at one of these lunches some years ago (can’t actually remember how many!) that I first met up with the person I have come to call T’Other Kate. Chance put us sitting beside each other on a long dining table and so of course we started to chat. It was easy and instant - and we’ve been talking ever since! Hang on though – ‘easy and instant’? Hmm – some people will be wanting to question that. How could it be easy, they’ll ask, when my main nickname for Kate is of course the other one I coined for her – Scary Kate? How can she be easy and Scary at the same time? So perhaps I should explain – Scary Kate . . .
Well, when we first met I was the established author. With my hopeless memory for dates, I forget how many years I’d been writing, how many books I’d written but I do know that T’Other Kate was at the beginning of her career. A few books – Medicals – accepted and published. It was obvious, reading those books, that she was destined for a successful career but I had no idea how much so! It was a case of light the blue touch paper and stand well back. As someone who’s not the fastest of writers myself, I’ve been standing back ever since. Watching as Kate produces books at a rate of words that I can only envy. And not only Medicals – she was one of the very first authors to be published in RIVA (way back when they were Modern Extras in another incarnation of the line). She even dedicated one of those – Strictly Legal - to me. It’s on my bookcase now in front of me as I write this. And now she’s about to be published in Cherish. And that’s without counting those local history and other factual books – see – scary . . . But that’s not all. I mentioned those other interests – music, piano, guitar, now there’s ballroom dancing. Food and cooking – Oh dear me, Kate’s hospitality is five star and the meals she provides. Well, all I can say about that is forget the diet if you’re ever lucky enough to go and stay with her! The Babe Magnet and I did once and we’re still talking about the food. And you know that saying that if you want something doing, ask a busy person – one of my favourite memories of Scary Kate is – coincidentally – from my own 50th book celebration. We had a party in Lincoln and Kate was invited. What I didn’t know was that she was getting busy in the background in the days before, organising surprises - cards – flowers, a beautiful necklace . . . She even managed to have a secret discussion with the Babe Magnet to find out what flowers would be special for me. It was a wonderful night and made all the more so by the way that Kate and so many other writer friends joined in. Which is why I’m really really happy to be here helping Kate celebrate her 50th book – and in London to see her get her 50th book pin from Harlequin. We shared a special occasion when I got my 50th book pin – and Kate got her 25th book award on the same evening and sharing things with friends always makes things so much more enjoyable. 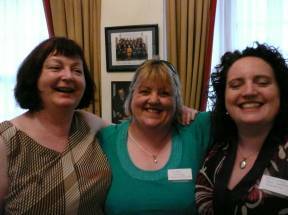 (Here’s a photo of us together - along with Fiona Harper - on that special evening.) That was back in 2007 . . . The only trouble is that in the intervening time I’ve only brought my total of published books up to 60. Now, in 2012, Kate’s celebrating her 50th! And there are more in the pipeline . . .
See what I mean about scary? Many many congratulations on this ‘golden’ book, Kate! And here’s to many more! I had to think about what I’d like to give away to celebrate this special book. Unfortunately, life has been rather stressful lately so I don’t have a new book coming out to talk about myself. But then I thought that there is one book that has special memories of me and Scary Kate and that’s my own 50th title – The Spaniard’s Red-Hot Revenge. This book is also in a 3 in 1 collection – Claimed By The Spaniard together with 2 other Sicilian books of mine – The Sicilian’s Wife and Sicilian Husband, Blackmailed Bride. So I have 2 copies of Claimed by the Sicilian to give away to someone who posts in the comments. I was going to ask you to say what scares you – but perhaps not! What don’t you tell me if there’s something special you’re celebrating this year. I know plenty of people who have had a tough year – so I’d really like to hear lots of good news! Hi to both Kates. Kate W I've been looking out for a new book from you for a while, it's been way too long since your last one and the lovely book discussion we had on Romance Book Haven. I hope it won't be too long until the next one. I've tracked down one or two of Kate H's to keep me busy reading meanwhile. Well the one thing I have to celebrate this year is that after a fourteen year break, I got home to Ireland during the summer. I live in India and left Ireland eighteen years ago to marry my husband. After our first two kids were born I got to go home, but when number three and four arrived, it became difficult and then we were restricted to school term times and what with having such a busy family with kids all different ages, we didn't find it so easy to travel for a long time. So this year, I finally got there, or should I say we did, all six of us. It was fourteen years since I'd seen Ireland and there was such a difference. There's lovely motorways and some new landmarks in the city and in some ways, it has moved on so much. Between catching up with all the relatives and trying to take in everything the time went way too fast. I'm hoping to go home again for a holiday in another two years and our children are interested in going there for their studies. Just being at home invigorated and refreshed me wonderfully. So I'm now looking forward to going home more regularly in future. This year is really etched in my memory as significant for this reason. It was such fun reading through the post. I have been teaching my daughter to drive, so we will be celebrating having another license in the house later this year. Always such a big milestone. I loved that Sicilian Trilogy. Heroes to die for. Loved your last one too KateW. Still working my way through your backlist and collecting Scary Kate's backlist gradually. You are not scary Kate. You can't scare me. I have 7 kids and one grandson, 2 ex hubbies 2 mad cats. Wow! Cool Cover!! Congrats to Kate, what an awesome success. Forgot the good news. Next month is 30 year anniversary. Hoping to celebrate by coming to UK and Europe next Summer. Hi Maria - I thought you would be here. Yes, my writing has been rather slowed down by life events this year but I'm hoping I'll have good news on that front soon. It's lovely to know that you'll be looking out for it. 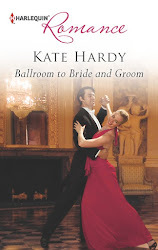 Meanwhile yo'll have lots - and lots - of T'other Kate's titles to keep you busy! I saw bits of reports of your trip home - it sounded wonderful. Perhaps next time it might coincide with one of my trips to Ireland? Oh Marybelle, reading your post I sort of wondered if your daughter having her licence is a celebration or a panic - great to know she can drive -but I'd be worrying myself silly over the thought of her out there on the road! I hope she's soon qualified and a safe driver so you can let her drive you where you want to go. Hello again Fiona - thank you for saying how much yo've enjoyed my books. I hope you find the backlist enjoyable too. I'm so pleased you loved my Sicilians - i know you have stron g opinions and high standards for your romances! If you do get to UK/Europs I hpe you have a wonderful time - congratulations on that very special anniversary. Ahhh my two favourite "Kate's" together! 'Nuff said. Caroline x p.s I've read your Sicilian Kate, and whoever reads it is in for a treat! Recently read THE FIREFIGHTER'S FIANCE and loved it! Liked how the H/h automatically put each other's needs first, enjoyed both of your POVs, thought the drama was well-written, and especially liked how the hero knew what he wanted and went after it (the heroine). Thanks for sharing your books with us. I recently read THE HOSTAGE BRIDE and loved it too! Couldn't put it down and had to read in one sitting. Could relate to the storyline and definitely could imagine myself in the heroine's shoes. Thanks to you too for sharing your books with us. Congrats to both of you for writing such enjoyable books, and I look forward to reading many, many more from both of you!!! Kooks - you're right - Kate isn't really scary - but her efficiency and out out is! You don't sound like you scare easily - justnthe thought of 7 kids scares me! I have 2 mad cats too - and they are enough of a handful. But then arebn;t cats always mad? I'm smiling at the thought of your husband celebrating being able to breathe! We shoould all celebrate that! I hope he has a happy birthday anyway. Tash - is it the Sicilian cover you like? I know Iloved it as soon as I saw it. Oh - that moment when your little one suddenly becomes a teenager. It takes some getting used to (I'll let you into a secret - It takes way more adjustment when they hit 30!!) You don't want to let your luittle on go but the great thing is that they always love you - no matter how old they are. I'm looking forward to the birth of my niece, I#m going to be an aunty for the first time! So exciting! Sounds like it would be fun to meet Kate. Not really celebrating anything. Love your books. My daughter will finish 8th grade this year. I know we will celebrate that. Thinking about her starting high school, makes me realize how quickly kids grow up. 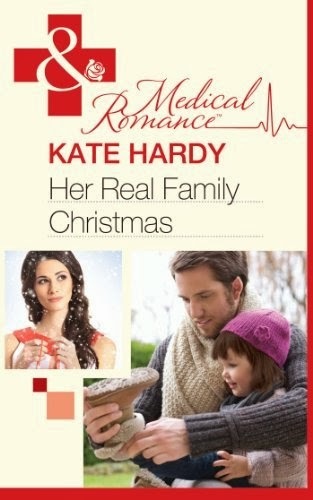 Hi Kate, yes, the Sicilian cover on the bottom right of the blog - is it a new type of cover? Very appealing. Oooooh thank you for that little secret, so good to know; especially as we hit those teen years hehehe! Sarahlouisa - the birth of your neice is somthning wonderful and special to celebrate. I hope she arrives safely and on time and that you love being a new aunt. bn - you're right. It would be fun to meet Kate. Hi Tammy - and thank you. You're right - they grow up so quickly! I hope your daughter enjoys moving to high school. That's a big move. To answer your question Tash - the covefr is one of the new UK designs for a the 3 in 1 collections here in the UK - I love it. And yes, remember that child care secret - in a few years! Hello Ellie - I just had to post to say how sorry I was to hear of your loss. But I hope that you will find the strength to celebrate your aunt's life as well as to mourn - and remember all the good things about her as well as your sadness now. Thanks Kate, for your kind word.